Our laboratory is devoted to investigate the neurobiological aspects of nerve degeneration and its consequences of neuroapthic pain, particularly focusing on small myelinated and unmyelinated nociceptive nerves (small-fibers) and their central pathways. These nerve fibers terminate in the skin and are responsible for the transmission of thermal and nociceptive stimuli. Previous studies were limited by their small diameter (usually 1-2 micrometers), and usually required electron microscopic examinations. We have developed new techniques to investigate the nerve terminals in a global scale, and used these approaches to set up models of nerve terminal degeneration. In addition to the loss of sensations, the other major consequence of nerve injury is neuropathic pain. By applying the above approaches including neuroimaging (fMRI), physiology (CHEP), and molecular biology, we also established an integrated system of neuropathic pain. A parallel focus in this laboratory is to use the previously described technique to diagnose human neuropathies involving small-diameter nociceptive nerves (small-fiber neuropathy). This is quite a difficult issue for neurologists because there has been lack of objective methods to quantify the degeneration of small-fibers. We are among the pioneers in this field to diagnose small-fiber fiber neuropathies in patients with inflammatory neuropathies and diabetes mellitus. We have extended our laboratory services to the diagnosis and therapy of human neuropathies: (1) CMT, including peripheral myelin protein 22 (PMP22), myelin protein zero (MPZ), and connexin 32 and (2) FAP for the genetic mutations of transthyretin, the most common form of FAP. 1. Tseng MT, Tseng WY, Chao CC, Lin HE, Hsieh ST. Distinct and shared cerebral activations in processing innocuous versus noxious contact heat revealed by functional magnetic resonance imaging. Hum Brain Mapp 2010; in press. 2. Hsieh YL, Lin WM, Lue JH, Chang MF, Hsieh ST. Effects of 4-methylcatechol on skin reinnervation: promotion of cutaneous nerve regeneration after crushing injury. J Neuropathol Exp Neurol 2009; 68:1269-1281. 3. Chao CC, Hsieh SC, Tseng MT, Chang YC, Hsieh ST. Patterns of contact heat evoked potential (CHEP) in neuropathy with skin denervation: correlation of CHEP amplitude with intraepidermal nerve fiber density. Clin Neurophysiol 2008; 119:653-661. 4. Chao CC, Sun HY, Chang YC, Hsieh ST. Painful neuropathy with skin denervation after prolonged use of linezolid. J Neurol Neurosurg Psychiatry 2008; 79:97-99. 5. Hsieh YL, Chiang H, Tseng TJ, Hsieh ST. Enhancement of cutaneous nerve regeneration by 4-methylcatechol in resiniferatoxin-induced neuropathy. J Neuropathol Exp Neurol 2008; 67:93-104. 6. Lin YY, Tseng TJ, Hsieh YL, Luo KR, Lin WM, Chiang H, Hsieh ST. Depletion of peptidergic innervation in the gastric mucosa of streptozotocin-induced diabetic rats. Exp Neurol 2008; 213:388-396. 7. Tseng TJ, Chen CC, Hsieh YL, Hsieh ST. Influences of surgical decompression on the dorsal horn after chronic constriction injury: Changes in peptidergic and d-opioid receptor (+) nerve terminals. Neuroscience 2008; 156:758-768. 8. Chao CC, Hsieh ST, Chiu MJ, Tseng MT, Chang YC. Effects of aging on contact heat evoked potentials: the physiological assessment of thermal perception. Muscle Nerve 2007; 36:30-38. 9. Tseng TJ, Chen CC, Hsieh YL, Hsieh ST. Effects of decompression on neuropathic pain behaviors and skin reinnervation in chronic constriction injury. Exp Neurol 2007; 204:574-582. 10. Chao CC, Hsieh ST, Shun CT, Hsieh SC. Skin denervation and cutaneous vasculitis in eosinophilia-associated neuropathy. Arch Neurol 2007; 64:959-965. 11. Chao CC, Hsieh SC, Yang WS, Lin YH, Lin WM, Tai TY, Hsieh ST. Glycemic control is related to the severity of impaired thermal sensations in type 2 diabetes. Diabetes Metab Res Rev 2007; 23:612-620. 12. Tseng MT, Hsieh SC, Shun CT, Lee KL, Pan CL, Lin WM, Lin YH, Yu CL, Hsieh ST. Skin denervation and cutaneous vasculitis in systemic lupus erythematosus. Brain 2006; 129:977-985. 13. Lin CY, Su YN, Lee CN, Hung CC, Cheng WF, Lin WL, Chen CA, Hsieh ST. A rapid and reliable detection system for the analysis of PMP22 gene dosage by MP/DHPLC assay. J Hum Genet 2006; 51:227-235. 14. Chiang HY, Chen CT, Chien HF, Hsieh ST. Skin denervation, neuropathology, and neuropathic pain in a laser-induced focal neuropathy. Neurobiol Dis 2005; 18:40-53. 15. Chiang HY, Chien HF, Shen HH, Yang JD, Chen YH, Chen JH, Hsieh ST. Reinnervation of muscular targets by nerve regeneration through guidance conduits. J Neuropathol Exp Neurol 2005; 64:576-587. 16. Lee JE, Shun CT, Hsieh SC, Hsieh ST. Skin denervation in vasculitic neuropathy. Arch Neurol 2005; 62:1570-1573. 17. Lin YH, Hsieh SC, Chao CC, Chang YC, Hsieh ST. Influence of aging on thermal and vibratory thresholds of quantitative sensory testing. J Peripher Nerv Syst 2005; 10:269-281. 18. Chang YC, Lin WM, Hsieh ST. Effects of aging on human skin innervation. NeuroReport 2004; 15:149-153. 19. Hsieh ST, Chu NS. Immunohistochemical study of skin nerve regeneration after toe-to-finger transplantation: correlations with clinical, quantitative sensory, and electrophysiological evaluations. Acta Neurol Taiwan 2004; 13:178-185. 20. Hsieh ST. Diagnosis and management of immune-mediated neuropathies. Acta Neurol Taiwan 2004; 13:39-45. 21. Hsu SH, Lee MJ, Hsieh SC, Scaravilli F, Hsieh ST. Cutaneous and sympathetic denervation in neonatal rats with a mutation in the delta subunit of the cytosolic chaperonin-containing t-complex peptide-1 (Cct4) gene. Neurobiol Dis 2004; 16:335-345. 22. Pan CL, Shun CT, Susuki K, Yuki K, Hsieh ST. Pharyngeal-brachial palsy after cytomegalovirus colitis. Neurology 2004; 62:153-154. 23. Pan CL, Kuo MF, Hsieh ST. Auditory agnosia caused by a tectal germinoma. Neurology 2004; 63:2387-2389. 24. Shun CT, Chang YC, Wu HP, Hsieh SC, Lin WM, Lin YH, Tai TY, Hsieh ST. Skin denervation in type 2 diabetes: correlations with diabetic duration and functional impairments. Brain 2004; 127:1593-1605. 25. Pan CL, Tseng TJ, Lin YH, Chiang MC, Lin WM, Hsieh ST. Cutaneous innervation in Guillain-Barre syndrome: pathology and clinical correlations. Brain 2003; 126:386-397. 26. Chiang MC, Lin YH, Pan CL, Tseng TJ, Lin WM, Hsieh ST. Cutaneous innervation in chronic inflammatory demyelinating polyneuropathy. Neurology 2002; 59:1094-1098. 27. Ko MH, Chen WP, Hsieh ST. Neuropathology of skin denervation in acrylamide-induced neuropathy. Neurobiol Dis 2002; 11:155-165. 28. Lyu RK, Chen WH, Hsieh ST. Plasma exchange versus double filtration plasmapheresis in the treatment of guillain-barre syndrome. Ther Apher 2002; 6:163-166. 29. Chien HF, Tseng TJ, Lin WM, Yang CC, Chang YC, Chen RC, Hsieh ST. Quantitative pathology of cutaneous nerve terminal degeneration in the human skin. Acta Neuropathol (Berl) 2001; 102:455-461. 30. Lin YW, Tseng TJ, Lin WM, Hsieh ST. Cutaneous nerve terminal degeneration in painful mononeuropathy. Exp Neurol 2001; 170:290-296. 31. Pan CL, Lin YH, Lin WM, Tai TY, Hsieh ST. Degeneration of nociceptive nerve terminals in human peripheral neuropathy. NeuroReport 2001; 12:787-792. 32. Pan CL, Yuki N, Koga M, Chiang MC, Hsieh ST. Acute sensory ataxic neuropathy associated with monospecific anti-GD1b IgG antibody. Neurology 2001; 57:1316-1318. 33. Hsieh ST, Chiang HY, Lin WM. Pathology of nerve terminal degeneration in the skin. J Neuropathol Exp Neurol 2000; 59:297-307. 34. 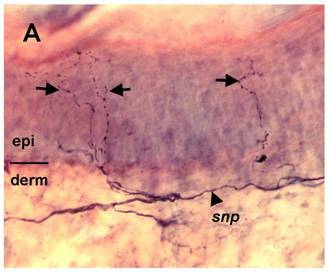 Chen WP, Chang YC, Hsieh ST. Trophic interactions between sensory nerves and the targets. J Biomed Sci 1999; 6:79-85. 35. Hsieh ST, Lin WM. Modulation of keratinocyte proliferation by skin innervation. J Invest Dermatol 1999; 113:579-586. 36. Huang IT, Lin WM, Shun CT, Hsieh ST. Influence of cutaneous nerves on keratinocyte proliferation and epidermal thickness in mice. Neuroscience 1999; 94:965-973. 37. Ko MH, Chen WP, Lin-Shiau SY, Hsieh ST. Age-dependent acrylamide neurotoxicity in mice: morphology, physiology, and function. Exp Neurol 1999; 158:37-46. 38. Hsieh ST, Kidd GJ, Crawford TO, Xu Z, Lin WM, Trapp BD, Cleveland DW, Griffin JW. Regional modulation of neurofilament organization by myelination in normal axons. J Neurosci 1994; 14:6392-6401. 1. Hsieh ST. Toxic neuropathies. In Schmidt RF and Willis WD, editors. Encyclopedia of Pain. Berlin, Germany: Springer-Verlag, 2007, pp. 2493-2498.